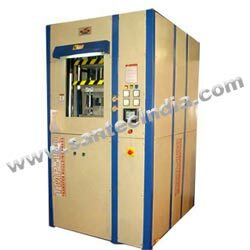 Transfer molding presses are specially designed for the production of simple and intricate parts from Malemine, SMC, Bakelite, DMC, etc. The presses have ejection facility or soft opening just after the churning period in order to avoid jerky movement that might damage the molded component. Transfer molding presses are used for precise moulding of rubber & rubber to metal bonded parts, encapsulated electronics, medical products, insert moulded connectors, etc. Transfer molding presses are state-of-the-art, PLC controlled hydraulic machines, available in different capacities ranging from 10 tons to 500 tons. These presses are based on advance designs, offered at economical prices. The precision four post construction of these presses offer rigidity, platen level and parallelism. Having various frame styles, these presses are fitted with exclusive deflection protection which assures perfect partingline parallelism. They are designed for unobstructed loading of inserts or extrusions and ease of removing moulded parts. The open side clamp allows work pieces to extend to right and left of machine for moulding. Injection molding presses are used for manufacturing plastic products by the injection molding process. These presses can fasten the molds in either a horizontal or vertical position. Most preferable presses are horizontally oriented, however vertically oriented presses are used in some niche applications such as insert molding. To fasten the tools to the platens, there are many options like manual clamps, hydraulic clamps and magnetic clamps. Injection moulding presses are classified primarily by the type of driving systems viz. hydraulic, electric or the hybrid of both. These presses reduce operation costs by cutting energy consumption. In addition to this, the presses address environmental concerns too. These presses are quieter, faster and highly accurate. Operation PLC Controlled with touch screen (MMI) for user-friendly operation.